Dutch physician; born at Amsterdam Aug. 16, 1834; died Sept. 28, 1902; son of the physician J. B. Stokvis (1808-87). He studied at the Latin school in Amsterdam (1843-50) and at the Athenæum (1856), visited Paris and Vienna (1857-59), and finally established himself as a physician in Amsterdam. In 1867 he was awarded a gold medal by the Brussels Academy for his essay "Recherches Expérimentales sur les Conditions Pathogéniques de l'Albuminurie." In 1874 he was appointed professor of pathology and pharmacodynamics at the University of Amsterdam. He was president of the Internationaal Koloniaal Geneeskundig Congres held in Amsterdam in 1883, and also of the first congress of Dutch physicians and surgeons. In 1879 he was elected a member of the Royal Academy of Sciences, and in 1896 its vice-president; and in 1884 the University of Edinburgh conferred upon him the degree of LL.D. Stokvis was the author of the following works: "De Suikervorming in de Lever in Verband met de Suikerafscheiding bij Diabetes Mellitus," 1856; "Over de Glycose Stof in de Lever," 1869; "Bijdragen tot de Physiologie van het Acidum Uricum," 1869; "Over de Sterfte van Croup bij de Nederlandsche Israelietische Gemeente to Amsterdam," 1869; "Voordrachten over Homoeopathie," 1887; "Voordrachten over Geneesmiddelenleer," 3 vols., 1891-1902 (vols. i. and ii., 2d ed. 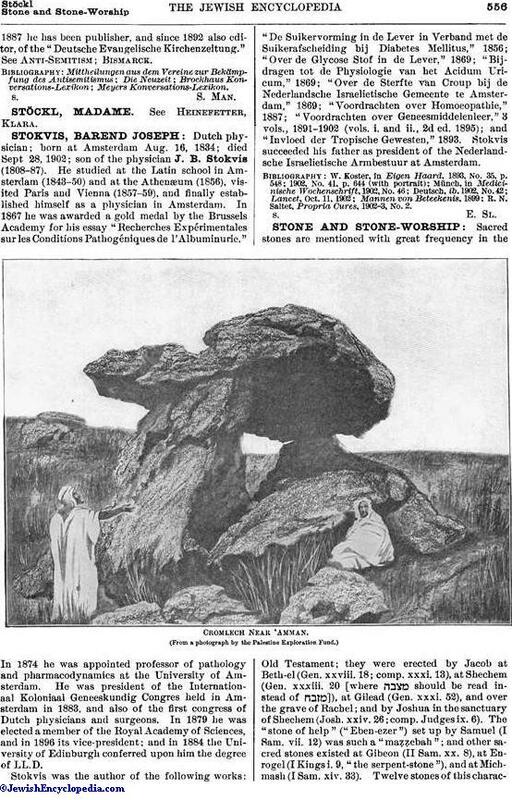 1895); and "Invloed der Tropische Gewesten," 1893. Stokvis succeeded his father as president of the Nederlandsche Israelietische Armbestuur at Amsterdam. R. N. Saltet, Propria Cures, 1902-3, No. 2.